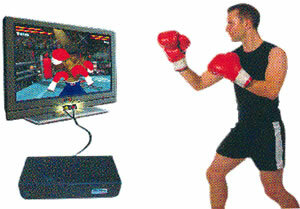 Virtual Play TV Boxing. 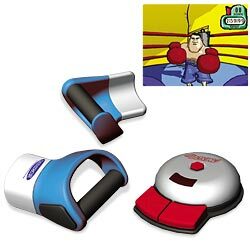 Just slip on the boxing gloves and the motion sensors detect your jabs, crosses, uppercuts, and the speed and power of your punches. Improve your skills during multiple virtual boxing training exercises that lead up to the big championship bout! Plugs into any standard TV or VCR audio/video in ports with supplied RCA cables. (Most TV's and VCR's purchased after 1984 have these ports--please double check yours to make sure!) Uses 4 AA and 4 AAA batteries, not included. For 1 to 2 players. Ages 8 to adult.